We’re starting 2010 off with the first of many house tours that will feature in some of our monthly newsletters and to get the proverbial ball rolling I thought I would open the doors to my home and invite you in for a look around. The bathroom was my most recent project; transforming the space in to a grown up, sophisticated yet tranquil space. 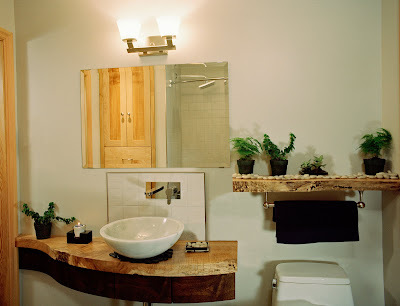 Countertops, cabinets and shelf all by Live Edge Design, toilet by Toto, shower and faucets by Fluid and sink by Decolav. 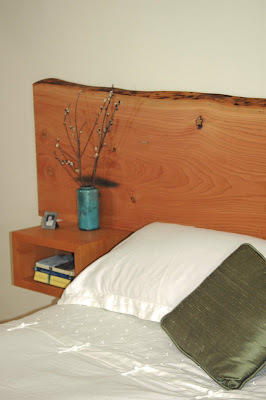 We redesigned the bedroom a couple of years ago and you may recognize some of these images but I thought it was worth revisiting. 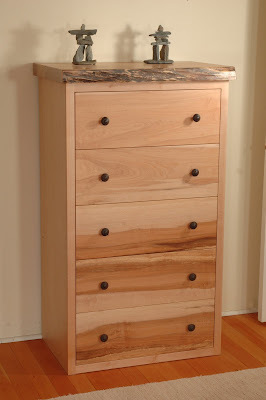 The warmth and tones in the wood are soothing after a long day. The dining room with view of the deck, garden and vegetable patch. 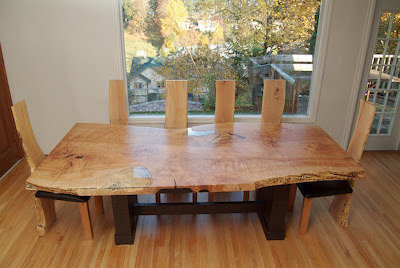 Single, character grade maple slab reclaimed from Cowichan Bay...the live edge on this slab was so wild I used glass to add function and retain a natural, yet refined aesthetic.